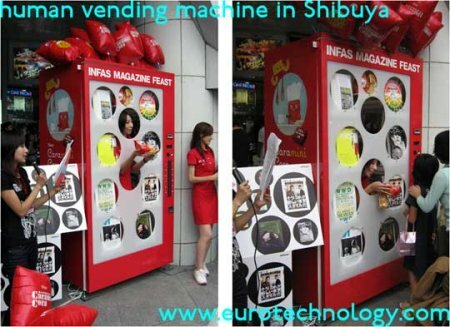 Some really cool stuff comes out of Japan, as does a load of wacky crap, this post is one of the latter, the human vending machine. It may look like an ordinary vending machine but inside is a normal person who will pass your purchased goods out to you. Comes complete with upper and lower serving windows depending on the height of the customer. I’m waiting for the McDonald’s vending machine that contains a human monkey to grill and spit on the burger before throwing it at you. Thanks to eurotechnology , Unique Daily and CScout. Thanks for letting us know, we’ve updated the link.